I hope these views are of interest. Your comments and/or further information are very much welcomed. Is this railway carriage still in use? Also worth noticing are the bathing machines, the sign (can anyone suggest what it might have said? ), plus the horse-drawn omnibus (were three horses usual for this purpose?). Early morning, judging by the angle of the shadows and the emptiness of the scene; it must have been very peaceful. 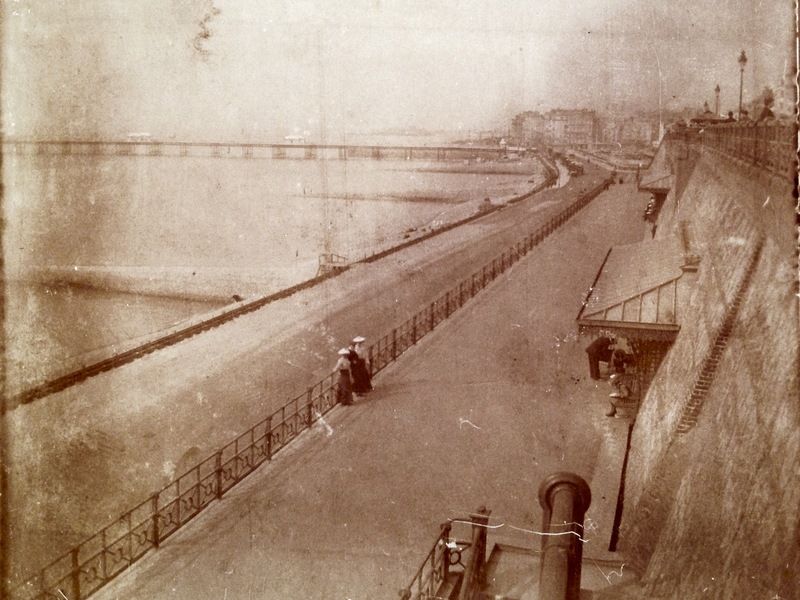 It can be seen along this stretch how the railway track and Madeira Drive ran parallel to each other and were very close to the sea at high water. The spray would sometimes break over. Next to the nearest groyne is a set of steps showing the significant drop from the road to beach level. 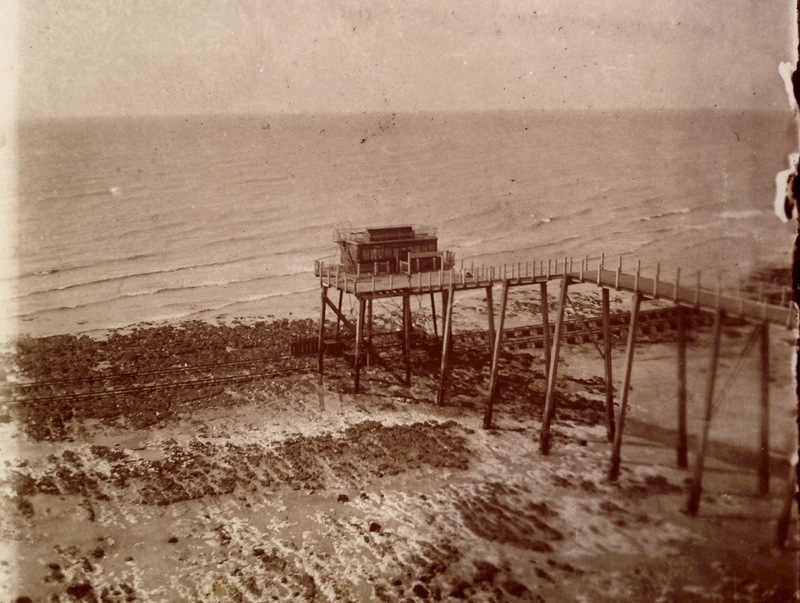 The Palace Pier’s Winter Garden had yet to be constructed. The intermediary Ovingdean Gap halt of Volk’s “Daddy Longlegs” Railway, but photographed soon after the line had closed. The trolley standards and wire were immediately dismantled, and as seen here, the Sea-Going Car was moored to the jetty until 1910 when both, in serious decay, were completely removed. From 1907 new groynes broke the redundant track into disconnected sections of approximately 500 feet. By 1914 most of the rail had been salvaged, leaving only the concrete sleepers, many of which remain today. I love these sorts of photos and these in particular. The photo of the Volk’s carriage looks much the same today and you are right to wonder if it is still in use. What a pleasant thought if it is. As a child, I had a theory that the warning ‘bell’ that drivers used, was a foot pedal that activated a hammer that struck one of the rails. Thus, the metallic sound. How near my theory was to the actuality, I don’t know. I wondered, too, about the railings in these photos. They look very similar to the ones that exist today. Modern ones seem very likely to have been copied from the designs in these photos. Or is it too much of a stretch to wonder if they are still the originals? Finding bits of the remains of the Daddy Longlegs was always an exciting game when I was a child in the 1950s. I don’t know how accurate we were, but any concrete blocks, found at low tide, to the east of the Palace Pier where always labelled, in our minds, as parts of the DL. Please post more of these if you have them! My family has a close association with the early days of Volk’s Railway. 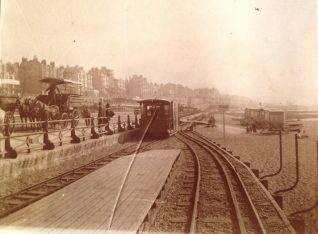 My great grandfather James Barker was described by the West Sussex Gazette as Volk’s “first engineer and [Magnus] Volk’s right-hand man over a long and difficult period of the railway’s history”. James also worked on the “Daddy Longlegs” and his son was a driver.